The goal of Chemistry, Biology and Biotechnology Research Center of the Faculty of Engineering is to promote the development of research by carrying out chemical and microbiological analyses, conducting research on chemical and physical processes in the field of environmental protection and control, quality and use of natural resources, production processes, and development of new technologies, as well as to integrate research into study process. RTA project “Research Grant of Rezekne Academy of Technologies” Latgale Blue Clay Usage Possibility Justification (project manager R.Tretjakova, duration- 2017). Tretjakova R., Grebeža J., Martinovs A. 2015. Research into biological characteristics of dried sapropel, Environment. Technology. Resources. Proceedings of the X International Scientific and Practical Conference. Volume 1, pp.223-227. 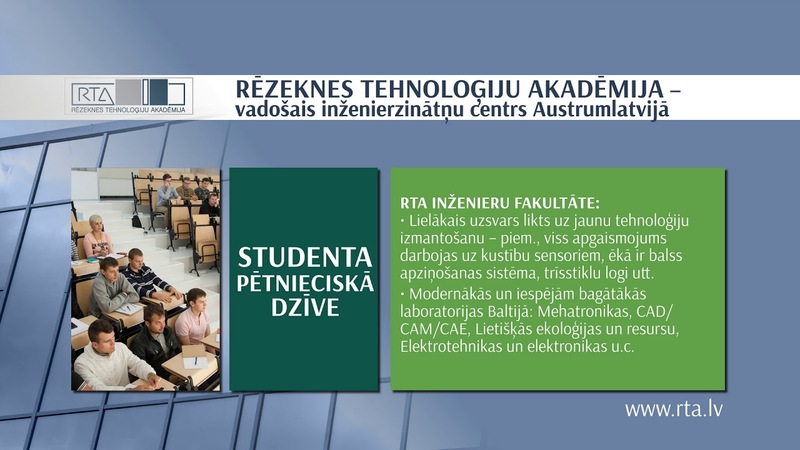 Rēzekne: Rēzeknes Augstskola, RA izdevniecība. (SCOPUS). Martinovs A., Timmerberg J., Tretjakova R., Beckmann P., Popa V., Wagner R. 2015. Mechanical and electrical properties of the solid sapropel. Environment. Technology. Resources. Proceedings of the X International Scientific and Practical Conference. Volume 1, pp. 139 – 146. Rēzekne: Rēzeknes Augstskola, RA izdevniecība. (SCOPUS).